Hey friends! I’m excited to share not one, not two, but three recipes with you today! Matt and I LOVE lettuce wraps, especially Asian-style ones. They’re so easy to make, refreshing, and packed with flavor. Here are three of my favorite healthy lettuce wrap recipes. The method for making delicious lettuce wraps makes them easy to mix & match – and you know how much I love mix & match recipes (check out my other mix & match recipe posts here, including avocado toast and grain salad bowls). Just cook your protein with some veggies, add a sauce or stir one up for dipping, and spoon everything into lettuce cups. Even though everything is wrapped up in lettuce, I like to use extra veggies into the filling for added texture, color, and flavor. Ginger and green onions add tons of savory flavor, shredded carrots and red pepper add crunch and bright color, and zucchini adds volume and soaks up flavorful sauce! 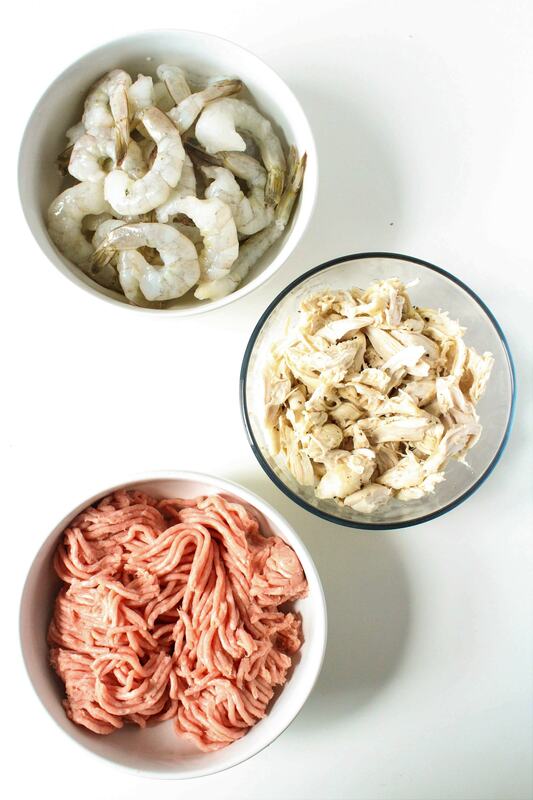 Take your pick and saute them in with your protein of choice. When it comes to the lettuce itself, go for whole heads of bibb or butter lettuce. They usually come with the root intact, so they’re really fresh, and the larger leaves are still attached – perfect for holding more filling! 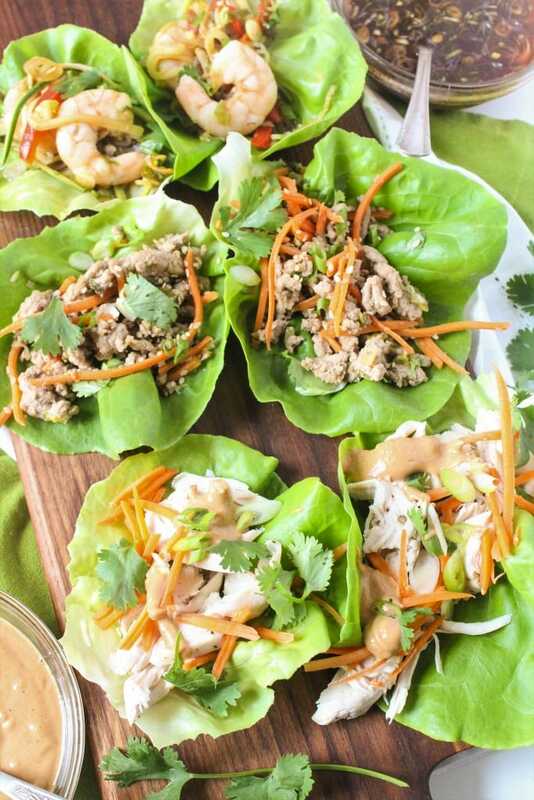 I love turkey lettuce wraps because it’s easy to mix tons of flavor into ground turkey, but I’m also a huge fan of shrimp and chicken – they all make lettuce wraps substantial enough for a filling meal. Ground turkey and shrimp also cook really quickly, so you can get dinner on the table in less than 10 minutes (!!! ), and using precooked rotisserie chicken makes for an even faster meal! If you’re vegetarian, crumbled tofu could easily stand in for ground turkey, or cubed and roasted tofu would make a great replacement for shrimp or chicken. The great thing about making sauces for lettuce wraps is that a few pantry staples can be combined in different ways to make several different meals. I keep low sodium soy sauce (or tamari for a gluten free variation), rice vinegar, sriracha, sesame oil, peanut butter, and limes on hand for sauce combos! 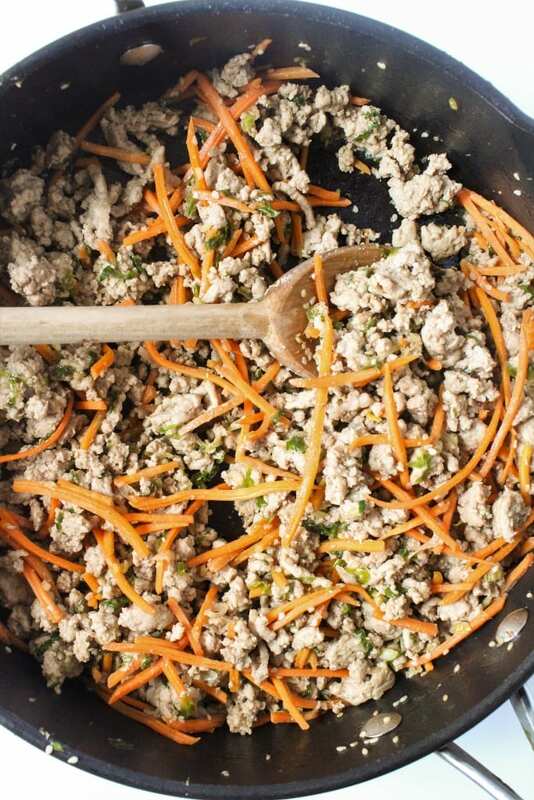 Saute green onions, ginger, shredded carrots, and ground turkey with soy sauce, sesame oil, and rice vinegar – and you’re good to go! Easy. 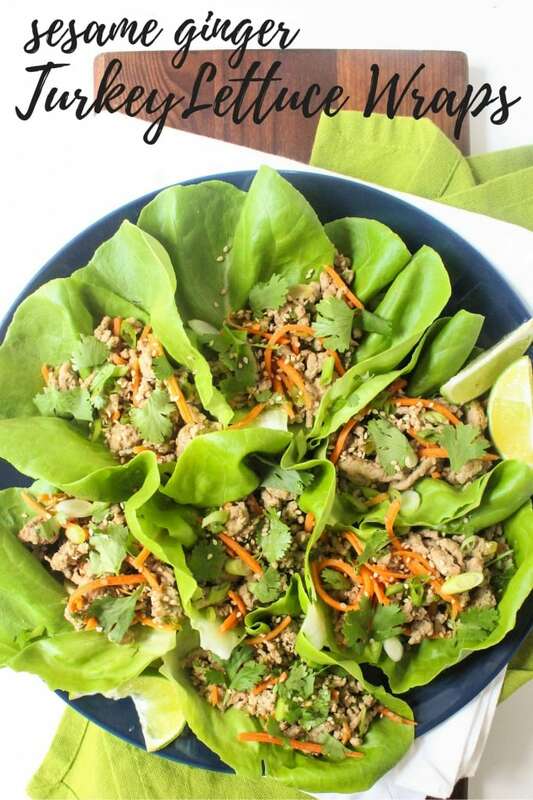 These lettuce wraps can be on your table in 10 minutes or less and are packed with sesame ginger flavor - perfect for a satisfying weeknight meal! Heat the sesame oil in a large pan over medium-high heat. Add the green onions and ginger and cook for 2-3 minutes, until fragrant. Add the turkey and carrots and cook until the turkey is mostly browned, with only a little pink left. Add the soy sauce, rice vinegar, and sesame seeds. Continue to cook until the turkey is cooked through and most of the liquid has evaporated. Serve in lettuce cups with cilantro, green onions, and lime to garnish. Peanut sauce is such an easy way to add tons of flavor to lettuce wraps. You can make a batch in advance and keep it on hand – and if you use precooked rotisserie chicken, you don’t even have to do any cooking when you get home from work. 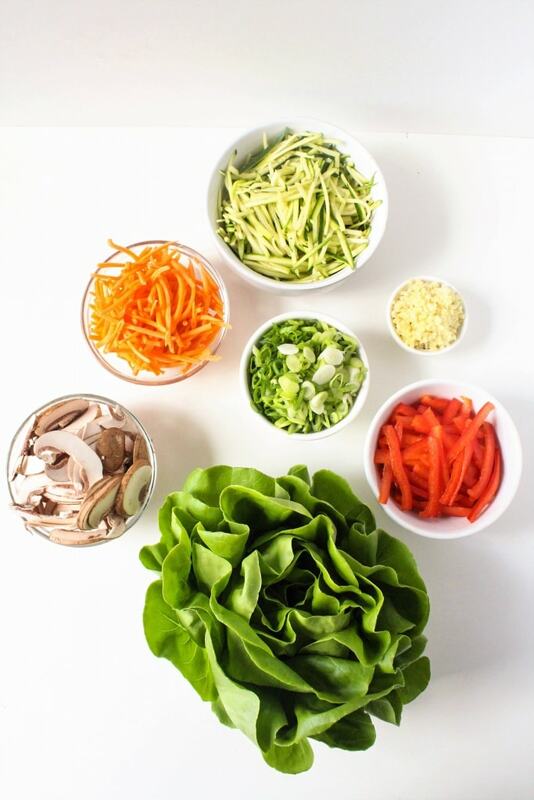 Just assemble everything into lettuce wraps and you’re good to go! 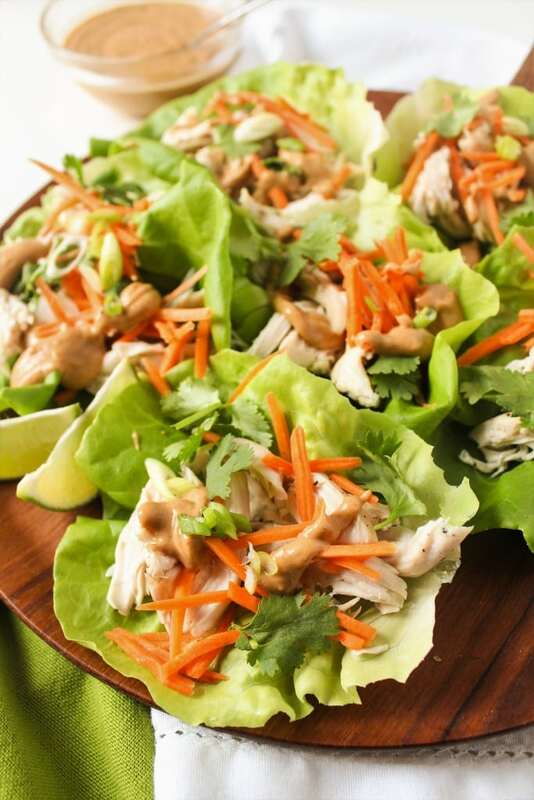 Rotisserie chicken makes these lettuce wraps so quick and easy - and peanut sauce is perfect for dressing up any weeknight meal! Dinner on the table in 5 minutes? Yes, please! Stir the peanut sauce ingredients together in a medium bowl until smooth. If the peanut butter seizes up, slowly add in more water, 1 teaspoon at a time, until the mixture is creamy. Set aside. 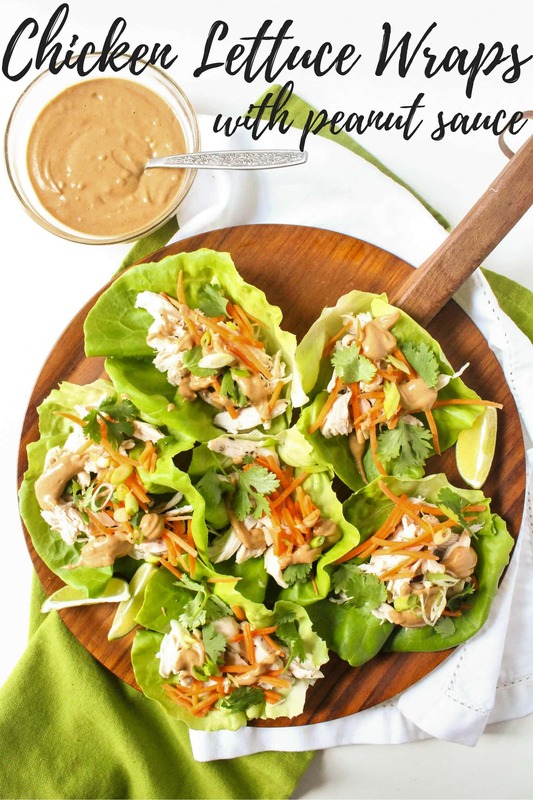 Place the chicken and shredded carrots in lettuce cups. 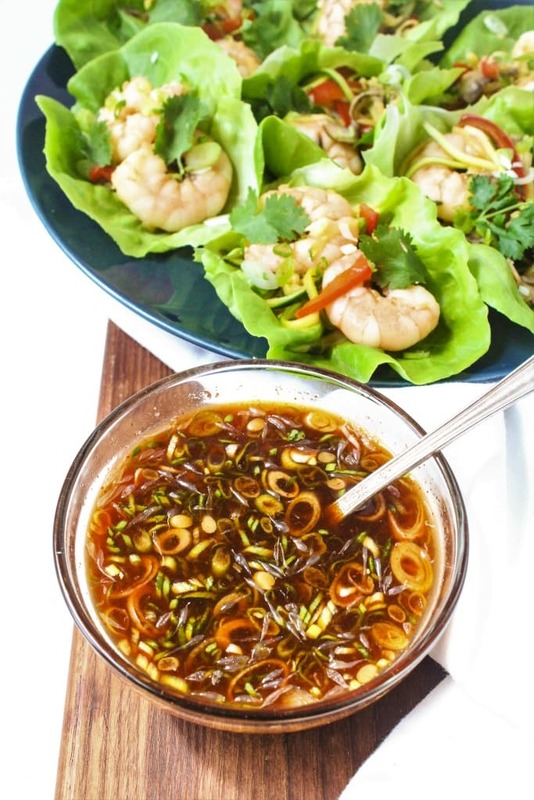 Drizzle with the peanut sauce and garnish with cilantro, green onions, and lime. 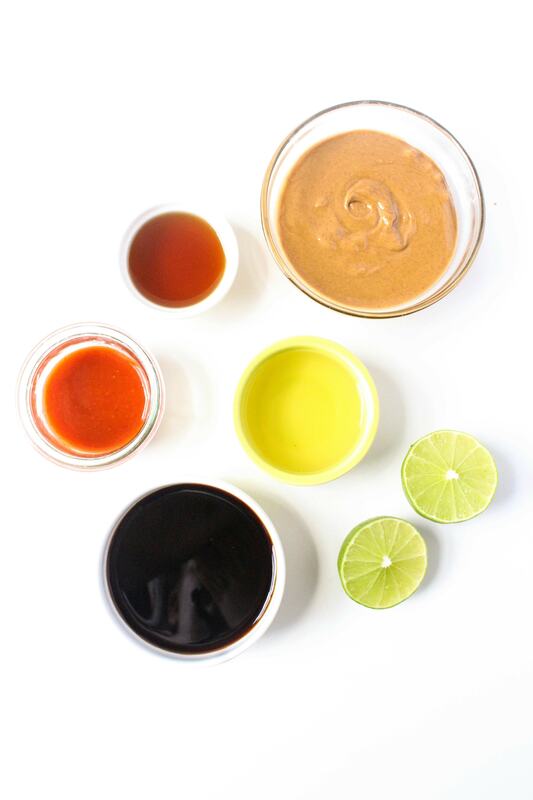 If you like spicy sauces, you’ll love this easy sriracha dipping sauce. It’s spicy without going overboard and really gets soaked up by the veggies and shrimp. Since shrimp cooks so quickly, this is another recipe that goes from stove to table in 10 minutes tops! 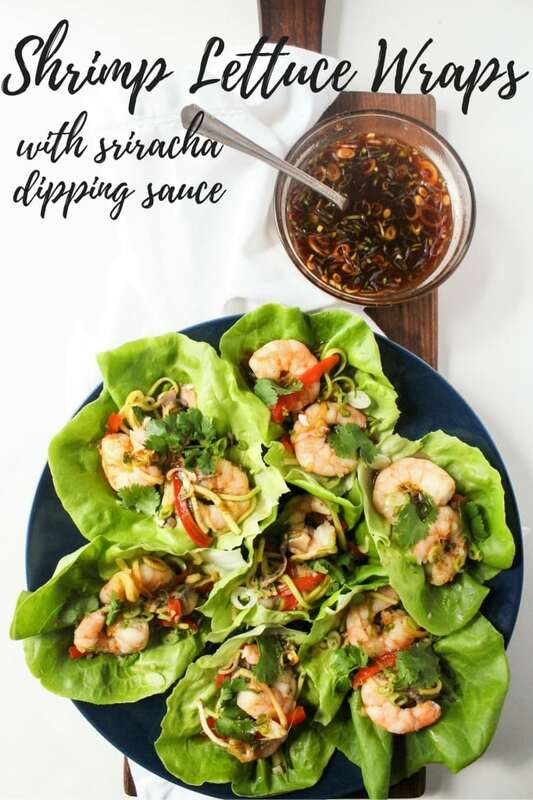 Spicy sriracha sauce compliments all the shrimp and veggies wrapped up in these lettuce wraps - and everything gets on the table in under 10 minutes! Heat the sesame oil in a large pan over medium-high heat. Add the green onion, ginger, zucchini, red pepper, and mushrooms. Cook for 3-4 minutes, until fragrant and softened. Add the shrimp, soy sauce, and lime juice. Cook another 3-4 minutes, until the shrimp is pink and cooked through and the liquid has mostly evaporated. Meanwhile, stir together all the sauce ingredients in a medium bowl. Spoon the shrimp mixture into lettuce cups, garnish with the cilantro, green onions, and lime, and serve with the dipping sauce. Love these quick & easy dinner ideas? Check out more of my favorite fast dinner recipes! 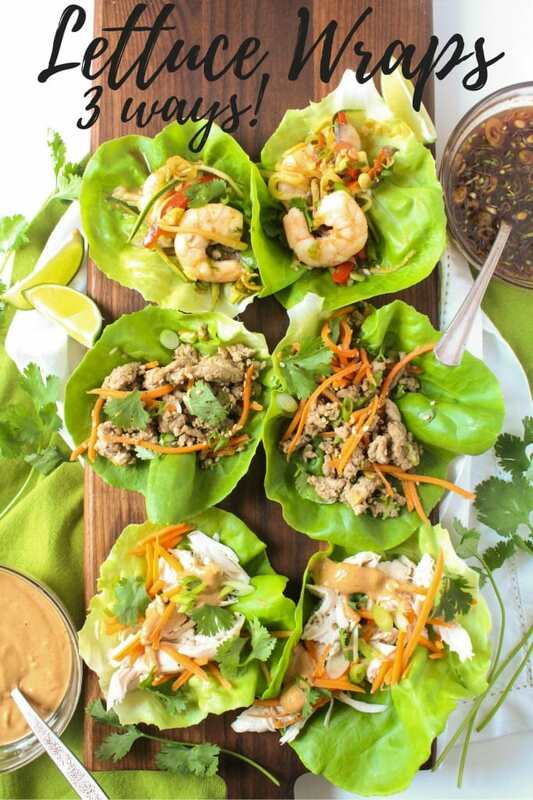 Are you a fan of lettuce wraps? What are your favorite filling and sauce combinations? There are so many good ones! These look awesome! When we were in Nashville last month for my sister’s bachelorette weekend, we ate at Bartaco our first night. They offered bibb lettuce in place of any of their tacos, so I tried their falafel on bibb lettuce. It was so colorful and refreshing! Falafel lettuce wraps are delish! Yes, please!! :) Thanks for the inspiration, Anne! These look delicious! These all look great! We are huge fans of lettuce wraps as well, I will have to give these variations a try. What a fun post! butter lettuce is the BEST for easy healthy wraps!